Using python and serial communication we are able to send commands to the arduino to run the different velocity profiles. The arduino output a pulse width modulated signal to the transistor. 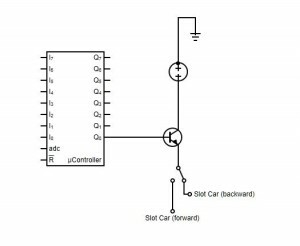 Using a transistor allowed us to get enough power to run the slot car track. We used a 12V power source hooked directly into the transistor. One issue we ran into early was the transistor overheating but we solved that by attaching a heat sink. From the transistor the signal was passed through a relay that we were able to control from a digital pin on the arduino (not pictured in circuit diagram). 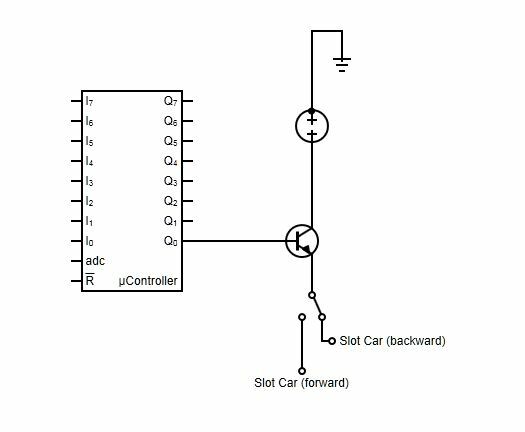 The relay could switch the polarity of the signal if we sent a high signal to the relay. This allowed us to make the car travel backwards and forwards around the track.